It was a dark and stormy night, that most wicked evening of All Hallows Eve, when a vengeful cry was heard across the land. It sounded like “Sqwaakk!” That’s right, fans of suicidal avian destruction, the latest version of Angry Birds Seasons is available now. “Ham’o’ween!” pits the Birds against their old enemies in 45 new levels of physics-based carnage. The latest version of the venerable mobile franchise includes new Halloween-themed levels set in pumpkin patches, haunted houses, and other generalized creepy locales. Some of the destructible environments include exploding pumpkins, jackolanterns, and the familiar precariously placed wood, stone and glass buildings. The puzzles are as fun (and frustrating) as ever, so if you’ve been jonesing for you next Angry hit, you won’t be disappointed. 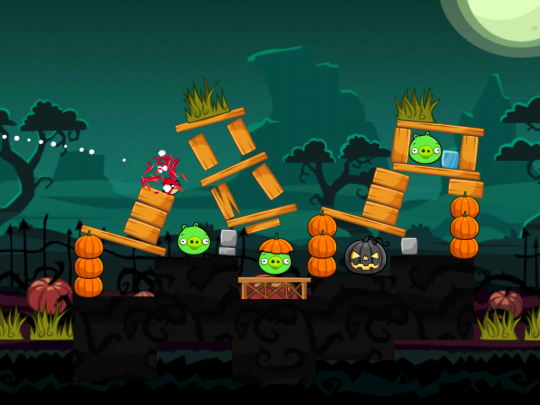 Like all Android versions of Angry Birds, Angry Birds Seasons is a free download. So head on over to the Android Market to get your copy. Then say goodby to your productivity for the next few hours.